EducationB.D.S. (Edin. ), MClinDent. (Lond. ), Cert. Dent. Implantology, GDC registration: 70077. Keith is a highly experienced dental practitioner, with a particular field of interest in cosmetic and implant dentistry. 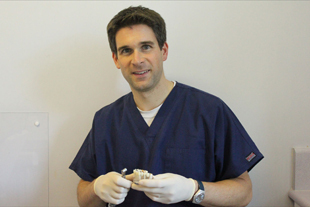 He has placed over 200 implants since completing his training in 2010, gaining a wealth of experience in this field. This experience ranges from simple single tooth replacement to more complex full mouth restoration- which involves replacing all of the teeth in the upper or lower jaw. His patients appreciate his reassuring and calming approach to clinical practice. Keith also welcomes referrals from other dentists, whereby you can visit his practice at North Berwick for implant treatment, and return to your own dentist for on-going care when the procedure is complete. Keith qualified from Edinburgh University in 1994, receiving the Final Year Medal for Restorative Dentistry. Following this he completed his year of Vocational Training, winning the Clinical Case Presentation Award. He then worked for two years at Glasgow Dental Hospital, gaining surgical experience and advanced restorative training. In 2010 he completed the prestigious four-year Masters in Clinical Dentistry from Kings College, London, graduating with Merit. This degree provided advanced training and knowledge in all aspects of restorative dentistry, including cosmetic, implant, tooth whitening and aesthetics. He continues to attend numerous cosmetic and implant dentistry conferences to learn from renowned international lecturers specialising in these areas. Keith’s ongoing learning helps him keep abreast of developments in what is a rapidly growing and diverse sector. Keith has also presented to other Scottish dentists to pass on his knowledge in the field of implant dentistry. Keith is a member of the British Dental Association BDA, an active member of the ADI (Association of Dental Implantology) and a full member of the BACD (The British Academy of Cosmetic Dentistry). Having grown up in East Lothian, Keith took up partnership in North Berwick in 2000. He lives in Aberlady with his wife and two daughters. When time allows he enjoys relaxing with the family, playing golf, badminton, and running on the beach with the family dog. Examples of Keith’s work can be found on our Smile Gallery. To discuss possible treatment options with Keith, please contact the practice, requesting an appointment with him on 01620 892267.